For almost forty years, the Star Wars films have built quite the franchise. Even if you have never seen the films, chances are you have become familiar with some of the characters and quotes. There’s also a huge chance that you have seen plenty of ads for The Force Awakens-the newest film in the series. While many viewers might have a hard time labeling these films as “educational”, the newest film has managed to teach us about demolishing stereotypes; especially those against people of color. While our media is showing how society is dehumanizing people of color, The Force Awakens does a decent job of reversing this mentality. Well, in the film, at least. In the film, there is a Storm Trooper who is a man of color, known simply as “FN-2187”. Pilot Poe Dameron later names FN-2187 “Finn” as the film progresses. Although this seems to be a small moment in the film, it is definitely a teachable moment for audience members. In the beginning of the film, this trooper is simply assigned a number, just like all the others soldiers he works with. He is never given a full name, thus indicating that he is viewed as more of an “object” instead of a human. However, once Poe gives him a name, Finn is “humanized” and begins to have a life of his own. Not only is this scene vital to the rest of the film, but it also strays away from how black males are typically portrayed in films. 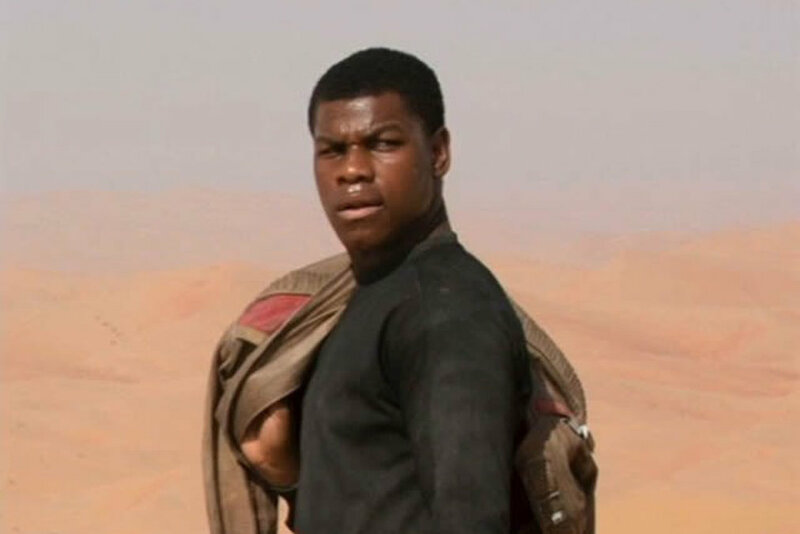 Unlike most films with black males, Finn does not become a villain or a victim of poverty and crime. Instead, The Force Awakens gives its character of color a chance to be seen as a human instead of a faceless monster. It is also important to note how Finn overcomes typical black stereotypes in The Force Awakens. Finn’s original job is a sanitation worker, which falls under the notion that most people of color can only work low paying jobs. Not only is Finn working at “the bottom of the food chain” so to speak, but he is also working for The First Order. For those of you who are unfamiliar with this term, The First Order is the group of villains in the film. So not only does Finn work a stereotypical job, but the beginning of the film portrays him as one of the villains. Pretty racist, Star Wars, pretty racist. However, Finn escapes The First Order because he does not want to kill. While most films would depict Finn as a villain for the entirety of the movie, The Force Awakens allows Finn to remove himself from an evil situation. Finn spends the rest of the film assisting our heroes, which is refreshing because our media spends so much time pushing a “black is evil” agenda onto us, yet we finally get to see a black character try and help save the day. Although Finn may not be the main hero in The Force Awakens, he is a pretty impressive character. He compromises his job and safety in hopes of finding a better life. As the film progresses, Finn manages to develop some close bonds with other characters and use his skills to help bring down those who are evil. As an added bonus? Finn accomplishes all of this without using drugs, gang violence, or any other stereotype that is usually given to a black hero in films. I’ll be totally honest: I’ve never really been into Star Wars, but after seeing The Force Awakens, I do have a newfound respect for this franchise and their ability to create a character of color without obnoxious stereotypes.